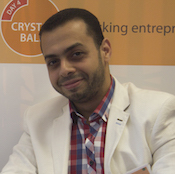 Omar is an Entrepreneur, CEO and founder of first private multidisciplinary research center in Egypt, dedicated to improve scientific research in the fields of natural and medical sciences. Omar is also a pharmaceutical formulation scientist, with a special interest in protein formulations, protein stability, polymeric drug delivery systems, applications of Layer By Layer (LbL) technology and biopharmaceutical studies. He holds a PhD in pharmaceutical technology from the University of Geneva and he is currently pursuing his MBA degree at HULT business school in London. Omar’s career involve over 10 years of experience in academia and industry. Believing in the role of young Arab scientists in the development of the whole Arab community, Omar joined the Arab Innovation Network (AIN) team and he is currently the AIN Projects Coordinator.